The Rev. Chelsy Bouwman grew up in Ponoka, AB where she was actively involved in the local parish of St. Mary’s. From there she moved to Edmonton to pursue a degree in music before heading to Toronto for graduate studies. Chelsy has had the privilege of serving in many different Anglican churches in Edmonton, Toronto and Belize, Central America. 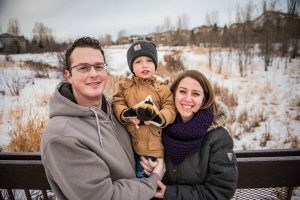 Nothing makes Chelsy more excited than to meet people where they are at and share her faith and love of Jesus with them and witness the building up of God’s kingdom through those relationships!In 2013 Chelsy married her husband Jordan and in 2015 they welcomed their son Maks. Together they are very excited to make Christ Church home.When she’s not hanging out at the church you can find her spending time with her family. She loves photography, reading, and singing with Kappella Kyrie Choir, cooking, gardening, camping and travelling.